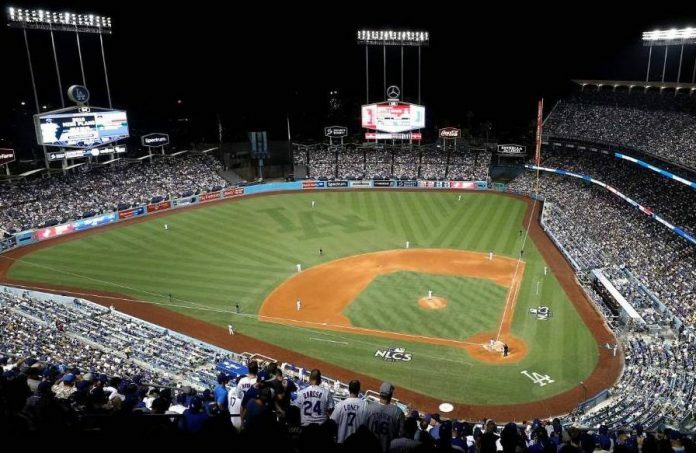 Linda Goldbloom spent August 25, 2018, as she had dozens of languid summer nights before, enjoying the warm breeze inside Dodger Stadium and listening to the crack of the bat. In the top of the ninth inning that night, according to ESPN’s Outside the Lines, Dodgers closer Kenley Jansen unleashed a 93-mph heater. San Diego Padres outfielder Franmil Reyes turned on the pitch, slicing it nearly straight back into the stands. The ball lined just over the protective netting behind home plate and cracked straight into Goldbloom’s head. The 79-year-old Los Angeles native was rushed to the hospital, where she died four days later. A coroner’s report, obtained by ESPN, confirmed that Goldbloom had been killed by head trauma caused by the foul ball. Goldbloom’s death raises new safety questions for Major League Baseball, which was rattled in 2017 when a 2-year-old girl suffered critical injuries after a foul ball hit her in the face at Yankee Stadium; the next year, all 30 teams extended netting farther down the baselines. Although Goldbloom’s death is the first in nearly 50 years directly attributed to a foul ball, hundreds of fans are struck every season and many have been seriously hurt. Most injured fans are also unable to win damages from MLB teams due to a long-standing legal precedent that critics like Goldbloom’s family say needs to be reexamined. MLB didn’t immediately return a message from The Washington Post. Reached by ESPN, the Dodgers said in a statement that the team was “deeply saddened by this tragic accident,” adding that “the matter has been resolved between the Dodgers and the Goldbloom family.” Brody declined to comment on whether a financial settlement had been reached with the baseball team. Almost as long as fans have filed into ballparks, teams have had to contend with protecting the public from hard-hit baseballs and broken shards of bats. In 1879, the Providence Grays were the first team to erect a screen behind home plate to shield fans in a risky area previously called the “slaughter pen,” according to a 2018 piece in the William & Mary Law Review. But it wasn’t until 1913 that courts had to decide whether fans deserved money when injured by a line drive or wayward bat. In that case, a man named S.J. Crane sued the minor league Kansas City Blues after getting nailed with a foul ball several years earlier. But the courts found he had no cause for action because his 50-cent ticket gave him the choice of sitting behind the home-plate screen, and he had decided to sit in an unprotected area instead, according to the William & Mary paper. That reasoning, which scores of other courts later followed, has come to be known as the “Baseball Rule.” As long as teams offer some protected areas, fans sitting outside that zone do so at their own risk – a warning still printed on the back of every MLB ticket today. It’s not an idle warning. A review by Bloomberg in 2014 found that 1,750 fans per year are injured by foul balls. Many of the injuries have been harrowing. In 2017, Sports Illustrated’s Gabriel Baumgaertner recounted some recent cases: a woman in Dodger Stadium whose jaw was broken in two places by a flying bat in 2008; a fan at Fenway Park who spent a week in serious condition at a hospital in 2015 after a thrown bat hit his head; a screaming line drive at Wrigley Field that same year that left a fan carted out on a stretcher. Per ESPN, only two fans before Goldbloom had ever died due to head trauma caused by a baseball at an MLB game: a 32-year-old named Clarence Stagemyer, who died in 1943 after being hit by an errant throw to first at Washington’s Griffith Stadium; and Alan Fish, a 14-year-old who died in 1970 after a foul ball at Dodger Stadium hit him in the head. But the biggest recent catalyst for change in MLB was the devastating near miss at Yankee Stadium on Sept. 20, 2017, when a foul ball off the bat of Yankees third baseman Todd Frazier hit a toddler in the face. Players knelt in horror. Yankees outfielder Matt Holliday reportedly cried at second base as the bleeding child was rushed to the hospital. In 2015, MLB first suggested that teams extend safety netting to the edge of both dugouts. But it wasn’t until the 2018 season that all 30 teams complied. That netting extension wasn’t enough to save Goldbloom, her family says. Goldbloom was born and raised in Los Angeles and became a die-hard Dodgers fan after the team moved to Southern California from Brooklyn in 1958. Her husband, Erwin, coached wrestling at a local college, Brody said, and the couple raised their three children as avid Dodgers fans. On August 25, the couple had special reason to celebrate: She had recently turned 79 and celebrated her 59th wedding anniversary with Erwin. They were joined at the game by her brother-in-law and sister-in-law. Brody says her mom had zero chance to avoid the ball that rocketed into the stands that night. “It was such a strong ball, it bounced off her head and still hit my uncle in the stomach,” she said. After being taken to Los Angeles County-USC Medical Center, ESPN reported, she was largely unresponsive for three days and kept alive on a ventilator. The family opted not to keep her alive by machines, per her wishes, and she died on Aug. 29. A coroner’s report obtained by ESPN showed that she died of “acute intracranial hemorrhage due to history of blunt force trauma,” citing her injury at the baseball game as the cause. Brody argued that MLB should raise the netting behind home plate high enough that line drives can’t reach the stands directly. Changing the legal precedent that largely protects teams under the “Baseball Rule” may be a harder battle to wage, but Brody said the logic behind it no longer makes sense in a game that’s changed exponentially since 1913. Brody said the family isn’t likely to return to a baseball stadium anytime soon. As the Dodgers fought their way to the World Series last fall, she could only think of her mother’s death watching the sport she loved.